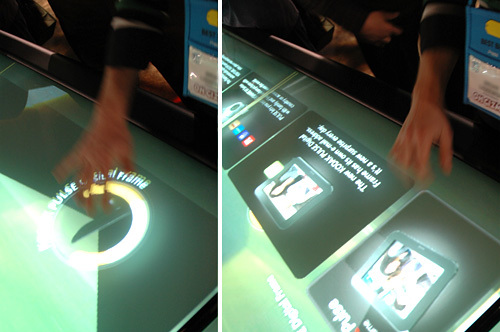 [CES 2010] Kodak's Giant Multi-touch River Of Products | OhGizmo! A lot of times at CES a company’s booth can be just as fun to play with as their products. 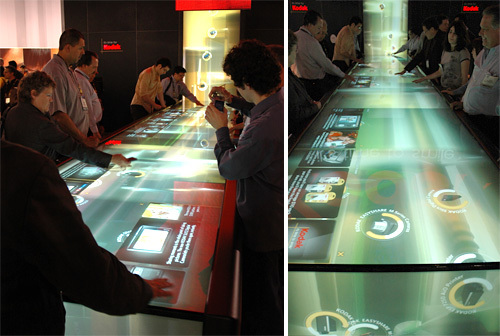 And that was definitely the case with Kodak who had this massive interactive multi-touch display featuring a virtual river of products at their booth. Their various devices would come down a waterfall and then slowly drift their way down the river, but at any point you could grab one, drag it to the side, and pull up additional product information. You could also simply touch the river at any point to get a cool ripple effect (isn’t that a pre-requisite for virtual water?) and at one point I must have counted 14 people interacting with the display at once, with absolutely no slow-down. It’s not always easy to make devices like printers or digital photo frames exciting, but given the crowd around this setup Kodak definitely found a way! Wow, I wish I could be there, they really go all out for CES. That's it, you found what I wanted from the show. I would like this installed in the basement please. D&D night is going to become loads of fun. 🙂 That and any other games and drawing… OMG the possibilities. Go Kodak, they are leading the way in grabbing attention.